Kevin is a Partner with Calcagni & Kanefsky, handling primarily complex matrimonial and commercial litigation. With 20 years of experience as a New Jersey litigator, Kevin regularly undertakes some of the state’s most complicated cases, including contentious divorces, sophisticated consumer fraud matters, franchise disputes, construction litigation, and mass torts. 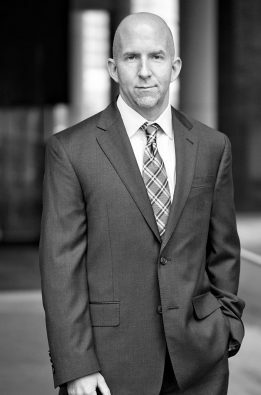 Prior to joining Calcagni & Kanefsky, Kevin worked with a series of preeminent commercial litigation firms. His representations have included design professionals facing complex construction and contract matters, automobile dealerships in disputes against manufacturers, and other private and public clients in a wide-range of civil and regulatory matters. Kevin recently served as General Counsel to one of New Jersey’s largest direct marketing firms. As General Counsel, Kevin designed and implemented an effective corporate compliance program, successfully defended the company against a series of class-action lawsuits, and favorably resolved a decade of litigation with the company’s most critical strategic partner. A New Jersey native, Kevin began his legal career as a judicial clerk in Ocean County Family Court for the Honorable Edward M. Oles, J.S.C. Coordinated formal withdrawal of prominent national insurer from New Jersey’s automobile insurance market. Successfully defended consumer-based class action against service contract providers and administrators arising from collapse of offshore risk retention groups and domestic reinsurers. Obtained multi-million dollar judgment in connection with national solid waste hauler’s fraud and unfair competition claims against competitor. Orchestrated settlement of more than a decade of litigation among consumer marketers, administrators, and insurers of consumer, auto, and home warranties. Defeated heavy-duty truck manufacturer’s attempt to constructively terminate poor performing dealers through re-branding of makes and models. Represented automobile dealers in prosecution of claims of wrongful termination and other improper franchise practices against the manufacturers. Defended design professionals and general contractors in connection with nearly one hundred residential and commercial construction-based cases. Litigating one of New Jersey’s oldest and most complex divorce actions at the trial and appellate level. Defending automobile dealers in individual and class-based claims of consumer fraud. Defending multiple physicians and dentists against allegations of insurance/Medicare fraud and RICO claims pending in state and federal court. Orchestrated legal challenge to municipal bond issuance in connection with New Jersey’s most controversial retail construction project. Defending consumer-based class action claims under the Telephone Consumer Protection Act and state consumer fraud laws. Obtained multi-million dollar summary judgment award in action to enforce subordination agreements serving as collateral for funding of mass tort litigations. Representing multiple physicians before the State Board of Medical Examiners against allegation of indiscriminate prescribing of narcotics.